It may be a “best-kept secret,” but central Texas has some of the best spots for fly fishing in America. With Texas native and fly fishing expert Aaron Reed as your guide, enjoy dozens of wades and paddles, all within easy reach of Austin. Discover secluded spring creeks braced by soaring limestone cliffs. Wade in broad pools dotted with lily pads and stands of water willow. Fish in neighborhood ponds and float deep, slow rivers. Easy-to-follow narrative, detailed maps, and gorgeous color photographs make it easy to “Go fishing now!” even if you have only a few hours to spare. There’s something for every angler in central Texas. Visit the nation’s southernmost trout fishery in the Canyon Lake tailwaters. Find seven species in a single day, including the native Guadalupe bass and the Rio Grande cichlid. 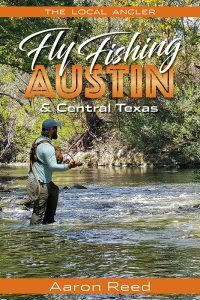 Fly Fishing Austin and Central Texas is your passport to the challenges and rewards of angling in this unique and beautiful region. * Tips for taking kids fishing. * How to catch a riffle-loving Guadalupe bass. The Lampasas River is one of several major tributaries of the mighty Brazos River that we will visit in these pages. The upper sections of the river lie just outside my self-imposed, roughly 60-mile radius from Auditorium Shores in downtown Austin, but it’s still an easy hour-and-a-half drive. I keep coming back to it for a couple of reasons: it’s a beautiful and diverse fishery, and the river is almost entirely passed over by all but a handful of dedicated local anglers and consequently receives very little fishing pressure. The stream rises about 16 miles west of Hamilton and flows mostly southeast more than 100 river miles to its confluence with the Leon River, where—along with the San Gabriel—it becomes the Little River. Fed by springs and numerous creeks, the Lampasas is clear but slow over the course of its upper and middle reaches, with a much more gradual drop than streams originating farther south in the Edwards Plateau. That low gradient means that fine silt and sediment from the surrounding sandy loam and clay agricultural lands can remain suspended for long minutes or even hours when a pool is disturbed. A school of carp or catfish, a herd of feral hogs, or a wading fisherman, can muddy one pool while the pools above and below remain crystal clear. Wherever the name comes from, a community dating to the 1850s adopted it and quickly became a center for area ranchers and other settlers. Later in the 19th century, the town drew tourists to the mineral springs that rise here. Today, Lampasas is a bustling town of about 8,000 souls. It’s a terrific base for exploring the area’s rivers. There is one impoundment on the river, Stillhouse Hollow Lake, well downstream about 5 miles southwest of Belton, and numerous road crossings along the upper and middle reaches. We will take a close look at two sections of stream that offer good access and reliable fishing. Notable for: Easy wading in a scenic rural setting; good populations of bass, carp, channel catfish, and freshwater drum; some huge and aggressive green sunfish; genetically pure Guadalupe bass in some sections. A friend turned me on to this reach of river a couple of years ago and it quickly became a favorite. I have run into other anglers there just once: a couple of good old boys who had been catfishing with gear, scrambling up the bank after an encounter with a herd of wild hogs. I continued on and had a lovely day on the unpeopled stream. Most of my favorite fishing spots give at least the illusion of rural seclusion. This section of the upper Lampasas truly is in the boonies. On one trip I was perplexed by the sound of large projectiles crashing into the river behind me. I couldn’t imagine who would be hiding just over the high bank, or why they would be throwing things at me, and I was beginning to get a little worried. Then I realized that what I was hearing, but wasn’t quite quick enough to see, was a burr oak shedding golf ball-sized acorns into the river. It’s that kind of lonesome out here. From downtown, take US 183 (tolls on the US 183A section) north about 70 miles to the city of Lampasas. On the north side of town, where US 183 jinks west, continue north on US 281 (the two highway numbers share the road through town) for 10 miles to Farm Road 1690, on the right. Follow FM 1690 3.75 miles and cross the Lampasas River. You will see a dirt track paralleling the road on your left. Park near the barrier close to the bridge. From the Killeen area or I-35 in Belton, take I-14 west until it becomes US 190, continue to Lampasas, then go right on US 183/281. The portion of the pool beneath the bridge is a jumble of cobbles and boulders, but the water is knee-deep or less during normal flows. Whether fishing upstream or downstream, you can head straight across here and then proceed on the far bank if you wish; this far bank is technically the south bank of the river, though it lies more westerly here. Let’s head upstream first, starting with the pool that ends beneath the bridge. This pool is wadeable on river left (your right as you head upstream) or may be fished from the large limestone boulders on the other side. The deepest section of the pool lies against these rocks, which provide fish-sheltering overhangs. There are big bass, channel cats, and carp in this pool, as well as bluegill, longear, and green sunfish. A pretty, low falls marks the top of the pool and then it’s a stroll across a corrugated limestone-and-gravel sill. The next pool is a long one, and deep. Approach with care and probe the tail of the pool; the limestone sill here is deeply undercut and holds fish. Continuing upstream, wade the shallows in the sand and gravel along the south bank. The deeper channel on river left (your right), with its heavy vegetation and steep bank, looks like the sure bet, but bass also cruise the drop-off just ahead of you. Bass here don’t go far when spooked, and once they realize they’re not being pursued by a predator, they seem happy to stop and consider whatever fly you drop in front of them. One afternoon, I watched a series of slashing rises below an overhanging sycamore on that north bank, thinking I was seeing a bass feeding on drifting damsel flies. It wasn’t until I hooked up and brought the fish to hand that I realized it was a slab of a green sunfish, just an inch shy of the state fly fishing record. It turns out there are a lot of big greens in the river, and they are aggressive feeders and a ton of fun on a light rod. At the head of this pool, the river bends due west. Wade the deeper water up the middle and then cross over to the gravel bank river left (your right) before the stream curves back to the northwest. There’s a jumble of boulders —a very fishy spot — on the far bank, river right. From here it’s about 750 feet upstream over a corrugated limestone-and-gravel bottom to the next sill. During normal flows the water is knee- to thigh-deep; wade straight up the middle or to the right as you head upstream. It’s more of the same until, about 300 yards beyond the riffle that marks the top of the previous pool, you’ll see a stand of flood-ravaged sycamores river right. There are a couple of nice, deep holes below the trees. Above this spot, the river shallows again and you’ll find the braided channel against the west bank. The slightly deeper pools in the sweeping channel bend here hold large numbers of longear sunfish. For some reason, the longears here retain their jewel-like spawning colors much later in the year than the same species in waters farther south. At the end of the bend, you may have to wade across the channel several times to follow the shifting gravel bars, but make your way to a spot on the east side (river left) so you can cast to the deeper water below the undercut bank river right. This is prime largemouth habitat and a great place to throw hair bugs, mice, big hoppers, or crawfish patterns. Just ahead is a large gravel bar on the east side, where the neighboring farmer stores his canoe. As the gravel bank peters out, at about 1.25 miles from the FM 1690 bridge, you will see a beautiful, deep pocket across the river and a thigh- to waist-deep pool upstream. Catch some bass and turn around for the trek back. The walk downstream from the FM 1690 bridge, after crossing the stream, is mostly on gravel bars on river right. A series of pretty green pools with deep water along the far bank feature plenty of jumbled limestone boulders and sunken logs for cover. You are likely to pick up a bushel of rough cockleburs in your shoelaces and clothing, but otherwise it’s an easy hike. At about the 350-yard mark, you’ll want to cross the river at a riffle and proceed along the north bank, river left. Eventually you will run out of gravel and find yourself wading in shin-deep water. This is a good stretch for sunfish and the occasional smaller bass. At the 0.375-mile mark, School Creek enters on river right. A short hike up that streambed will bring you to School Creek Falls, which are spectacular after a good rain. The large, circular pool below the falls holds a variety of fish year-round, but they are wary. You can also access School Creek by parking at the southwest corner of the <strong>FM 2527 bridge</strong> (31.23618, -98.11897) and hiking downstream to the Lampasas River. Skirt the falls by following a dirt trail around the huge, fallen table rock river left. The Lampasas is a mere 500 feet downstream. Back on the Lampasas, make your way downstream over gravel bars to the left bank and the long pool that begins at a little over half a mile below the FM 1690 bridge. The pool offers overhanging vegetation river left and jumbled boulders river right. Wade it along the north bank or down the middle until it is about thigh-deep, at which point you will want to edge back to your left and hop up on the limestone shelf that continues downstream the length of the pool. This is an extraordinary stretch of water—the pool stretches the length of about two football fields—and you could spend half a day here. There are ledges in shin- to knee-deep water along both banks, and they get wider the farther downstream you go. At the same time, the channel between them gets deeper—neck-deep toward the bottom of the pool. The ledges are deeply undercut and provide shelter for dozens, perhaps hundreds, of channel catfish, freshwater drum, and big bass. The drum and the bass follow foraging cats, waiting for them to kick up a meal. None of the fish are studying the surface here, though you may pick up a loitering bass on a popper or hopper. A better bet is to fish deep—wooly buggers, crawfish patterns, and damsel nymphs seem to work well. If the school of fish moves away, be patient: they’ll be back shortly. As the main channel begins to shallow again, switch back to a light streamer or surface fly for bass and big sunnies at the shallow tail of the pool. Continue wading river left; there’s another, smaller pool ahead with an undercut limestone ledge along the south bank. At 0.79 miles from the bridge, the river makes a gentle S bend and starts to move away from FM 2527, the road running alongside the right bank. A huge, silvered tree lies stranded atop the gravel bank at the bend; just beyond it, shallow water dotted with fish-sheltering boulders stretches toward the next curve of the stream. Somewhere along here you’ll want to wade across the riffle and begin walking the broad gravel bars river right. About a mile downstream from the bridge, you’ll see a pool with spring seeps over jumbled boulders river left. There are bass, carp, and cats in this pool and it’s worth spending some time here. Plus, it’s just downright beautiful water. Below this last pool, a small waterfall spans the river. This is a great place to call it a day and begin the walk back upstream. There is good water below, as the river turns almost due south, but the next easy access point, at the FM 580 crossing (31.17184, -98.07101, park on the northeast side of the bridge) is 5.5 miles downstream. Still, you might want to check it out on the way home, because just below the FM 580 bridge, another long and broad pool, easily wadeable in thigh-deep water, narrows to a deep tail with undercut ledges. It offers the same assemblage of catfish, drum, and bass as similar pools farther upstream. From FM 580, it’s another 4.8 river miles to the FM 2313 crossing (31.11895, -98.05533, excellent parking northeast side), where the mix of bass species begins to tilt significantly away from largemouth to Guadalupe. This stretch of river, about 3.5 miles centered on the historic bridge, is hands-down my all-around favorite in Central Texas. The mixed schools of carp, spotted gar, redhorse suckers, gaspergou (freshwater drum), white bass and largemouth bass are one reason. The clear water that allows me to watch them is another. From downtown, take I-35 north through Georgetown to Exit 266, and pick up TX 195, a fast four-lane road headed north. After about 27 miles, less than a mile beyond the Lampasas River bridge and just before the Ding Dong Café on your right, cross the southbound lanes to go left (west) on FM 2670, which roughly parallels the river. Set your trip odometer as you make the turn. In about 3.6 miles, a single-lane blacktop on your left will lead to an abandoned iron truss bridge over the river. If you follow FM 2670 over the river on the new, fenced-every-which-way bridge, you’ve gone too far. Take the old road down to the galvanized barrier and park in the roadway. There is a very rough trail between the blacktop and the creek (called Gann Branch) that enters the Lampasas just upstream of the bridge. A better bet is to walk across the old bridge and follow the well-worn dirt trail down to the south bamk on the downstream side of the bridge. There is a distressing amount of trash here, along with spray-painted graffiti and occult symbols (the bridge allegedly is a hot spot for paranormal activity; I say kids in the country are both inventive and have a lot of time on their hands). A broad, gravel streambed shows evidence of campfires, anglers, and infants. (Really, people? You can’t carry out your kids’ dirty diapers?!) The river channel is shallow and runs along the north bank. About 800 feet below the bridge, the gravel bar (and most of the trash) comes to an end. The stream runs faster here than it does closer to Lampasas, but it runs clear over a mostly gravel bottom. The first, broad pool is shallow but offers some decent water along the south bank, which is shaded by cottonwoods, elms and pecan trees. Wade down the middle of the river here, in knee-deep water, until you come to the next gravel bar, river right, at 0.32 miles. Your best shots along this stretch will be against the bank river left, where the water is a bit deeper and sunken logs and boulders hold fish. As the gravel bar disappears, cross diagonally to the north bank of the river from which, at about 0.45 miles, you will be able to cast to a deep pool beneath large trees and heavy vegetation river right. This is another “everything pool,” with bass, catfish, freshwater drum, carp, sunfish, and even white bass present year-round. This pool alone is worth the drive north. The current runs fairly fast through the pool, even at low-to-normal flows; be sure to cast far enough upstream that your fly has time to get down to the fish, which are typically patrolling the deeper water here. At the tail of this pool, cross a pretty riffle to walk river right. You may notice some metal fence posts driven into the gravel bar here, with purple blazes warning that you are on or near posted private property. This is a questionable warning, at best, as it is the fixed, permanent bank—not the gravel bar—that is the legal boundary of public waters in Texas. Walking along the edge of the bar you will soon come to another deep run with dozens of boulders scattered throughout the water, mostly along the north bank. This run, at about 0.55 miles, is a great place to toss a mouse, hopper, popper, or small streamer for Guadalupe bass and big green sunnies. At about 0.71 miles, as you run out of gravel on the south bank, wade across the shallow stream to proceed downriver on river left. The deep water along the south bank flows beneath overhanging trees; this is a great spot for spotted gar and carp. At 0.96 miles, a large gravel shoal—an island, really—bisects the river. If you were inclined to camp, this would be a good (and legal) place to do that. A deep, curving run on river left is worth some time, especially if there is timber caught in the bend, but the portion of the river that follows the south bank also is interesting, with good bass and sunfish action beneath the willows in the bend just before the two channels come back together. Below the confluence, a tall, limestone bluff rises river right. Swing a soft hackle wet fly or nymph through the riffle for feisty little Guadalupe bass. Wade down the center of the stream through scattered boulders and then edge toward the north bank to fish a deeper hole at 1.2 miles. There are some carp in this section of the river, as well as bass, catfish, and drum. Below the long, rocky run, at 1.3 miles, the river bends south with a high, dirt bank river left. A limestone ledge runs down the middle of this bend and provides cover for some hefty largemouth bass. Cast against the far bank for Guads and sunnies. A dirt track leads down to the gravel bar river right, here. You will see picnic tables and even a portable restroom under the trees on the bluff. This is private property – a neighborhood park owned and maintained by the River Ridge property owners’ association. Don’t use it without permission. Cross the shallow pool at the bottom of the bend, to the gravel bar river left. If you’d like to catch your first redhorse sucker, this is a great place to find them feeding in the shallows. Just below this pool, at mile 1.6 from the old bridge, a gravel bar separates a backwater river left from a riffle that empties into a deep pool with jumbled limestone along the north bank. The eddy in the backwater, along with downed trees caught in the bend, are home to some huge common carp and at least two grass carp upwards of 40 pounds. These fish will eat while cruising the edge of the current here. 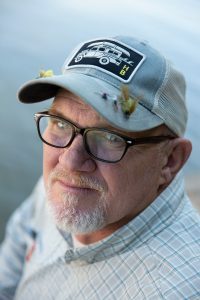 Try dead-drifting a damsel nymph over the drop-off, or placing a backstabber or crawfish imitation on the sandy bottom in the backwater. The fish here will run for the brush pile; a 5- or 6-weight rod with some backbone may be needed to turn them. The remainder of this pool can be fished productively from the gravel bar river right and is home to some truly huge river bass in the 5- to 6-pound class. This pool usually is my destination, and turn-around, on the downstream stretch. It is possible to continue on through productive, wadeable water to the TX-195 crossing (30.973300, -97.7340). If you choose to make a one-way wade or to shuttle, park off of TX-195 on the northeast side. A paved turnout there will leave your vehicle in clear view of passing traffic and is preferred to parking beneath the bridge on the southwest side. Storm’s Drive-In in Lampasas has been in business since 1950, when it was the “Dairy Cue” (the neon sign still graces the front of the restaurant). A drive-in fronting US 183/281 right in the middle of town, it features outdoor seating under a covered pavilion. The restaurant grinds its own hamburger on site, and the fries are fresh cut. Elvis was a frequent visitor when he was a young soldier stationed at nearby Fort Hood more than half a century ago; folks say he would roll up in his Cadillac and order a strawberry shake with his meal. Storm’s still doesn’t serve alcohol, but a frosted Coke can really hit the spot after a long day on the river. Open 6:30 a.m.–10 p.m., Sun.–Thurs., till 11 p.m. Fri. –Sat. The Lampasas River marks the western limit of the natural range of the American alligator, and a few of the reptiles can still be found lurking in deeper pools upstream from Stillhouse Hollow Lake. In 2015, two Killeen men shot and killed an 11-footer that was hooked on a catfish line. The men were rattled, but game wardens didn’t buy the story that they’d shot the gator in self-defense, and so charged them with misdemeanors. Hunting and habitat loss threatened alligators with extinction in the 1950s, and by 1967 they were considered an endangered species nationwide. By 1985 numbers had rebounded so well that the species was “de-listed.” There are approximately 5 million American alligators in the wild today, spread across the southeastern United States, including the eastern and southern parts of Texas. Alligators can reach lengths of 8 feet or more in about 15 years, continue growing until age 25 or 30, and some live so long they could collect Social Security if otherwise eligible. Only a few, perhaps five animals from an average 38-egg clutch, will survive to maturity. Fully one third don’t even get to hatch, instead becoming snacks for raccoons or, increasingly, feral hogs. Domesticated pigs were introduced to the Americas by Spanish explorers and colonists. If the first pigs arrived at a mission in Texas on a Tuesday afternoon in 1731, the first feral hogs were rooting around in a river bottom by that weekend. Smart, adaptable, prolific, and omnivorous, their success was assured even before Texas hunters imported Eurasian wild hogs, or “Russian boars,” in the 1930s. The Russian hogs freely interbreed with the feral domestic species. These are not the jolly pink porkers your grandmother raised on the farm. Swine in the wild revert to the hairy, heavily muscled, tusked versions seen in Stone Age cave paintings in just a couple of generations, which for pigs can be only a few years. The average size of an adult feral hog is 150 to 200 pounds, but animals four times that size have been recorded. The population of wild pigs in Texas today is estimated to be 1.5 million and growing fast. These animals are seldom aggressive, but unprovoked attacks by large, solitary males have been documented. There are four recorded fatalities in Texas; three were by animals wounded by hunters. Given the choice, a wild pig will nearly always attempt to flee. So will big cats. That’s what “the Goldthwaite jaguar” was doing on the night of September 3, 1903, when it was cornered and shot out of a tree by a group of men who were likely looking to kill the much more common mountain lion, or cougar, when they went “tiger hunting.” The 6-and-a-half-foot long, 140-pound cat was killed 3 miles south of Center City, roughly 25 miles from our Lampasas River access point at FM 1690. Since male jaguars can range over more than 50 square miles, and love water, it’s not unlikely that when we wade the Lampasas, we are walking in the ghost prints of that very cat. Sadly, the killing of the Goldthwaite jaguar signaled last call in Texas for the world’s third-largest “big cat.” Jaguars were common, if never especially numerous, in the central and southwestern portions of the state as late as the 1850s, but habitat loss and conflicts with ranchers led to their disappearance from the scene by 1948. That was the year a jaguar was killed along Santa Gertrudis Creek on the storied King Ranch south of Corpus Christi. Today, there are an estimated 15,000 of the big cats in Central and South America. Mexico is thought to have about 500 remaining jaguars, including some in a pocket of habitat just 75 miles south of Texas’s Rio Grande Valley. Like the remnant populations of ocelots and jaguarundis—Texas’s other tropical wildcats—jaguars don’t recognize political borders and historically have crossed back and forth over the Rio Grande. It’s not impossible that they could return, but it grows increasingly unlikely as South Texas’s population continues to grow and suitable habitat becomes ever more fragmented. Wildlife biologists are in widespread agreement that the construction of a border wall to thwart human immigration would probably spell the end of all three cat species in Texas.